'We do not seem to be able to cooperate as effectively as we should,' said Foreign Secretary S Jaishankar earlier this month in New Delhi. He was referring to the disjointed approach of India and China on a variety of issues including terrorism and a seat for India into the Nuclear Suppliers Group (NSG), among other things. Running from north to the east of New Delhi is the 3488km long, unmarked and imaginary Line of Actual Control (LAC) that separates the two Asian powers. It has been a barometer of the warmth (or the lack of it) between the two. Apart from witnessing a full-blown war in 1962, the LAC has also played host to several skirmishes, incursions and transgressions in the later years. Notwithstanding the lack of cohesion in ties, the LAC has cooled down. Transgressions (distinct from incursions) from the Chinese side into India show a sharp fall. The Sino-Indian border, though peaceful for decades, has not been free from surprise. When Chinese President Xi Jinping visited India in September 2014, his arrival was punctuated with the arrival of the Chinese People's Liberation Army in Ladakh where a tense stand-off followed. Days before Chinese Premier Li Keqiang was to visit India in May 2013, the Chinese forces were locked in a bitter face off with the Indians in the Depsang, Ladakh. 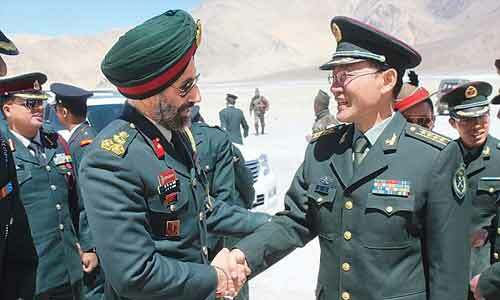 Indian Army's ability to detect and thwart Chinese efforts of intrusion has improved manifold and is showing results. That apart, better coordination and understanding fostered by high level visits have helped explained an officer who did not wish to be quoted. On Indian side, the Army and the Indo-Tibetan Border Police have their boots on the ground at the LAC. Both have seen a ramping up of efforts with enhanced manpower and resources. The Army has identified 14 Strategic Rail Links of which in July the government accorded 'in principle' approval for four. Advanced Landing Grounds at Walong, Ziro, Along, Mechuka, Tuting and Pasighat. One at Tawang and Vijaynagar will take longer. IAF has also based its heavy Sukhoi 30 jets at Tezpur and Chabua and will soon activate the second squadron of C130 special operations plane at Panagarh which is home to the Army's Mountain Strike Corps, a China-centric formation being raised. Outgoing IAF chief Air Chief Marshal Arup Raha on Wednesday said India was aware of the Chinese build up and was doing what was necessary for its security. Before the reforms, India would face the Chengdu and Lanzhou Military Regions (MRs).